Onarga Military Academy High School "Yellowjackets" & "Spartans"
Onarga (population 1,438) is located in upper eastern Illinois in west-central Iroquois County. U.S. Route 45 intersects with Illinois Route 54 in Onarga. Interstate Highway 57 lies just to the west of town and has exit ramps leading to Route 54. The Illinois Central Gulf Railroad runs through Onarga as well. Onarga lies about 30 miles southwest of Kankakee. Onarga was being settled in the early 1800s and became incorporated as a town in llinois in 1853. A phenomenal website dedicated to the Onarga Military School can be found at http://www.onargamilitaryschool.com/history.html . The Onarga Military School was officially established in 1917. Prior to 1917 the school was known as the Grand Prairie Seminary. 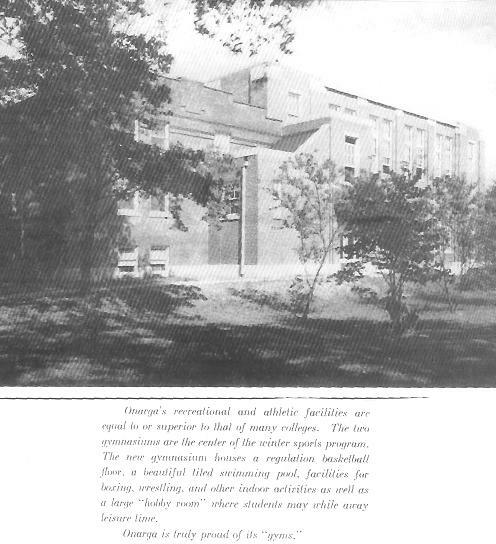 The Grand Prairie Seminary was a co-educational private "preparatory" school. According to a 1950s Onarga Military School catelog found on the website address of www.cadetweb.net/pdf/onarga.pdf, there was a trend to make private schools exclusively boys or girls in the early 1910s. The Board of Trustees met in 1917 and made the utltimate decision to make Grand Prairie Seminary an all-boys Military School. Onarga Military School was for boys entering fifth grade through senior year in high school. It was a boarding school where the students lived on campus. The tuition was quite expensive. If you wanted to send your son to Onarga Military School in the early 1950s, your base tuition would have been $1,485. With added expenses for washing his clothes ($1.60 per week), and charges for luxuries such as having a radio in his room ($.50 a week) it would cost about $1,600 a year for a child to attend OMS. This may not seem like much until you account for inflation. When you convert $1,600 from 1953 to 2005 the comparable cost today would be a little over $11,000 per year. However, as the catalog states, "The cost of Onarga Training is not an expense; it is a sound Investment that pays a lifetime of dividends to the boy". OMS was not called a "Military School" for no reason. It was run by a United State Army Brigadier General J.E. Bittinger from 1917 to 1942. There was also no doubt it was a military school judging by the daily schedule. "Reveille" at 6:15 a.m., exercises at 6:40 a.m., and breakfast at 6:50 a.m. The rest of the day was filled with structure up until the playing of taps at 10:00 p.m. 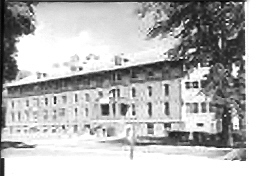 The Onarga Military School stayed in operation until the very early 1970s. It seems the anti-war sentiment and rising costs got the better of OMS. The exact year is not available, but we believe Onarga Military School closed her doors in 1970. School Fight Song: "On Onarga" to the tune of "On Wisconsin"
The football team competed in the Wauseca Conference with "five other public schools". Basketball and track were probably also a part of the Wauseca Conference but at this time we have not verified that. There is an excellent season by season record of the basketball program from the 1940s through 1970. One athlete also won a medal from the State Track Meet. The school took its athletics very seriously and made it a part of the cadet's everyday life. The Onarga Military School Cadets had some real nice seasons in their time. One Onarga Military School thinclad carried the banner for the school's track team. In 1948 Lawton Lamb was STATE CHAMPION of ALL SCHOOLS in Illinois when he won the 1 Mile Run in the old one-class system!! 1947-48 Lawton Lamb 1 Mile Run STATE CHAMPION!! Some of the better Onarga Military HS football records are listed below. Thank you to Tom Sikorski for his research. Onarga Military last fielded a football team in 1968.